Taubman Museum of Art Main Entry and Atrium. Credit: Timothy Hursley. Courtesy Taubman Museum of Art. ROANOKE, VA.- The Taubman Museum of Art, located in downtown Roanoke, Virginia, will open its new building to the public on November 8. The 81,000 square foot structure is the first purpose-built art museum ever constructed in the city and a significant step in the further development of the region as an arts destination of national and international stature. Governor Tim Kaine and other officials will preside over a ribbon-cutting ceremony at 10 a.m., which will be followed by 12 hours of free admission to the museum and entertainment for the public from 11 a.m. to 11 p.m. The free museum admission and entertainment is provided courtesy of presenting sponsor Advance Auto Parts, major sponsors Carilion Clinic and WDBJ7, and sponsors Allstate Insurance Company, Appalachian Power Company, Cox Communications, Woods Rogers, PLC, Lamar Outdoor Advertising, and Clear Channel Radio. The public opening will conclude several days of special previews attended by the many individual, corporate, foundation, and government patrons whose generous contributions have made the new Taubman Museum of Art building possible. 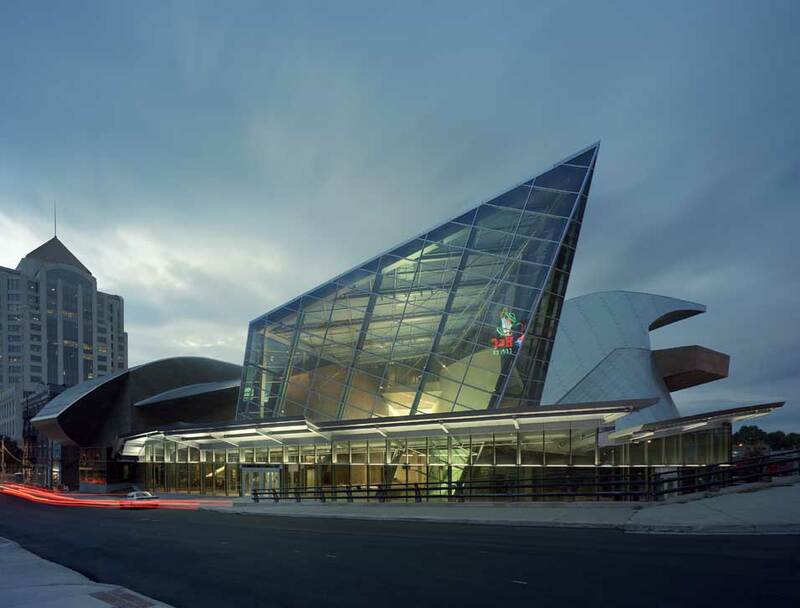 The Taubman Museum of Art was designed by Los Angeles architect Randall Stout, principal of Randall Stout Architects, Inc. and a noted proponent of sustainable green architecture. A dramatic composition of flowing, layered forms in steel, patinated zinc and high performance glass, the building pays sculptural tribute to the famous Blue Ridge mountains that frame the city and shape the regions spirit. The Taubman Museum of Art will be the architects first major freestanding museum. The facility is situated on Salem Avenue, between Market Street and Williamson Road, bounded by railway tracks at one of the most visible intersections in downtown Roanoke. The Taubman Museum of Art is named for lead patrons U.S. Ambassador to Romania Nicholas F. Taubman and his wife, Mrs. Eugenia L. Taubman. In addition to two spacious temporary exhibition galleries and eight permanent collection galleries, the design features a multi-purpose auditorium, a flexible theatre/programming space, Art Venture (the Art Museums interactive gallery and art center for children), a works on paper study room, a studio classroom, a museum store, and a café with indoor and outdoor seating, as well as staff offices, art storage, and preparation areas. Evoking a grand mountain outcropping, a faceted glass form soars skyward at the center of the overall composition, providing a glowing central interior space for information, ticketing, temporary art installations, scheduled museum functions, and informal encounters. The Taubman Museum of Art Building - At the heart of downtown Roanoke, the 81,000 square foot Taubman Museum of Art building will be Roanokes most contemporary structure and provide an analog for the citys evolution from industrial manufacturing town to technology center. The buildings forms and materials evoke the drama of the surrounding Shenandoah Valley landscape, as well as the building culture of the early 20th century railroad boom that first brought Roanoke to prominence as a major urban center of the new South. The finish on the buildings undulating stainless steel roof forms reflects the rich palette of colors found in the sky and the seasonal landscape. Inspired by mountain streams, translucent glass surfaces  some clear and others frosted to filter and modulate interior daylight  will emerge from the buildings mass to create canopies of softly diffused illumination over public spaces and in the galleries. As it rises to support the stainless steel roof, a layered pattern of angular exterior walls surfaced in shingled, patinated zinc gives an earthen and aged quality to the façade. The Taubman Museum of Art building occupies three levels above ground, with all functions organized off a 4,300 square foot space where natural light pools during the day; at night, the translucent glass roof is illuminated to allow the atrium volume to glow like a beacon for visitors. Hokie stone, an Appalachian dolomite limestone native to western Virginia and quarried in Blacksburg, is used in public spaces at ground level and elsewhere throughout the building. Variations of tone and texture in the stone are intended to evoke the striations, clefts and eroded surfaces found in the regions famous caverns, cliffs and river gorges. More than 11,000 square feet of gallery space for permanent collections and temporary exhibitions are located on the buildings second level. Illuminated glass treads lead visitors up a limestone-clad grand staircase to the galleries. At the landing, a luminous sculptural ceiling of cascading, back-lit translucent polycarbonate panels draws visitors forward through the central gallery hall to the permanent collection galleries. In the contemporary and American art galleries, this luminous ceiling feature extends into these spaces to diffuse daylight from clerestory windows and skylights above. The third, and uppermost, level of the building holds the boardroom, directors suite and staff offices and receives significant natural daylight through many strategically placed clerestories created by the buildings layered exterior roof forms. The building contains advanced technology for distance learning to serve the entire region of western Virginia. All gallery and education spaces are wired to link to broadband networks across the state to enhance K-12 education and provide greater access to the visual arts. Such technology also will enable the museum to interface with artistic endeavors at other museums, universities and institutions across the Commonwealth, across the nation, and beyond. A partnership with Virginia Tech will result not only in educational initiatives, including the development of innovative teaching methodologies to benefit western Virginias schools, but also in curatorial collaborations as well. In keeping with the trustees mandate, the building features significant sustainable design components, including modulated day lighting, radiant heating and cooling, a thermal conserving envelope, and computerized building management systems, among other ecologically smart mechanisms. In 2007, the Taubman Museum of Art received one of the prestigious 2007 American Architecture Awards awarded by The Chicago Athenaeum: Museum of Architecture and Design and Metropolitan Arts Press Ltd., which honor and celebrate the most outstanding new accomplishments for architecture designed and built in the United States by leading American firms and international architecture firms practicing in the USA. Project Funding The Taubman Museum of Art is funded by a $66 million capital campaign. Gifts to the campaign currently total over $53 million. The capital campaign will continue for several years as pledges continue to be paid off and additional gifts are recorded. The museum also will continue to raise funds to build its endowment. The Taubman Museum of Art is the boldest public-private partnership ever undertaken in the western region of the state. In addition to the Taubmans lead gift, major gifts to the campaign include donations by the Horace G. Fralin Charitable Trust, the Estate of Peggy Macdowell Thomas, Advance Auto Parts, Carilion Clinic, Medical Facilities of America, and The Kroger Company Mid-Atlantic Division, and Garnett E. and Pasty T. Smith. The City of Roanoke, the Commonwealth of Virginia, and the U.S. Department of Housing and Urban Development have each made appropriations to support the project. The Permanent Collection In addition to holdings of 19th and early 20th century American art, significant modern and contemporary art, new media art, photography, and design and decorative arts, the museums permanent collection also includes several smaller areas of specialty, including visionary art, Japanese prints, European art, and ancient Mediterranean art. Important acquisitions to the permanent collection have increased of late, with over 500 noteworthy pieces added in the past eight years. In 2001, Peggy Macdowell Thomas, grand-niece of Susan Macdowell Eakins, bequeathed her collection of important works by landmark artist Thomas Eakins, his wife, Susan Macdowell Eakins, and their circle, including paintings, sketches, decorative arts objects, archives, photographs, Japanese prints, and personal effects. From 1998 to the present, the Horace G. Fralin Charitable Trust has enabled the Art Museum to purchase masterworks by Winslow Homer, John H. Twachtman, Childe Hassam, J. G. Brown, Maria Oakey Dewing, Maurice Prendergast, John Singer Sargent, Robert Henri, William Bradford, Theodore Robinson, Norman Rockwell, George Inness, Edward Steichen, and others. American decorative arts acquisitions, supported in large part by the Rosalie K. and Sydney Shaftman Endowment, range from an 1810 Abingdon tall clock attributed to cabinetmaker Peter Rife to modern design objects by Raymond Loewy. A collection of over 90 crystal encrusted Judith Leiber handbags and 30 pillboxes will be displayed in a setting reminiscent of a garden. The museums support groups for acquisitions, the Collectors Circle and the contemporaries, will continue to add artworks to the collection. Recent additions include pieces by Hermann Herzog, Jasper Johns, Robert Rauschenberg, Romare Bearden, Jacob Lawrence, Petah Coyne, John Cage, Jiro Okura, Dorothy Gillespie, David Diao, and nationally prominent regional artist Sally Mann. Areas of recent focus include the work of emerging photographers and a commitment to new media pieces, a reflection of the transformation of western Virginia into a new technology research and development center. World Record For Juan Gris at Christie's New York - $20.8 Million For " Livre, pipe et verre"